Children's entertainer Buxton. Dozy Dave has performed at hundred's of parties within the Buxton area. We supply an advanced, fast-moving show for children. parties include a mixture of Magic, Dancing, Games & Balloons for prizes. Our shows will make sure children of all age groups entertained for the duration of the performance. scroll lower down this page to see our party videos. Dozy Dave is possibly the top children's entertainer Buxton. His fast-paced parties incorporate a concoction of Magic, Music, Games and balloons and are the perfect choice for your child's party. Christening or wedding. Choose from the 1hr - 1.5hr or full 2hr package. Every package has tons of audience participation, prizes and fun for children of all ages. Dozy Dave has been performing for many years as a full-time children's entertainer and can provide a variety of distinct packages to suit your requirements any time of the week. Dozy Dave performs in all areas within Buxton plus Wilmslow, Macclesfield and Altrincham. Dozy Dave has many different party packages to suit all budgets and ages of children. Please don’t wait to contact Dozy Dave if you are thinking about something particular? As Dozy Dave and his team will do their utmost to make sure your next event is the best in Buxton. WOULD YOU LIKE TO GET A QUOTE FOR THE Dozy Dave MAGIC SHOW ? Just click the Quote button to open up our quotation form. Our shows for younger children contain Magic, Music and Laughter. If the event is a birthday party, then the birthday child is always made to fee the centre of attention. For our nursery shows we understand the children can be a little shy at first so we always start the show very quietly and when the children have become more confident, so the pace of our shows increase. Fast paced show from start to finish, lots of very funny magic and audience participation. The birthday child is always the first child to help, always front of the line and always gets one of our wonderful LARGE balloon sculptures. Shows include magic, games and dance songs which contain actions. Shows range from 1hr - 2hrs, or 3 - 4 Year Old Parties if required ? Older children's parties contain competitive games, music and magic. Balloon Motorbikes are made for prizes. If there is a good mix of boys and girls, then we will compete them against each other as this helps keep the older boys engaged. Our magic shows are more grown up, but still with lots of comedy. As always the birthday child is made to feel the most important. YOU ARE ONE CLICK AWAY FROM THE PERFECT EVENT. Please feel free to contact us for a free no obligation quote. 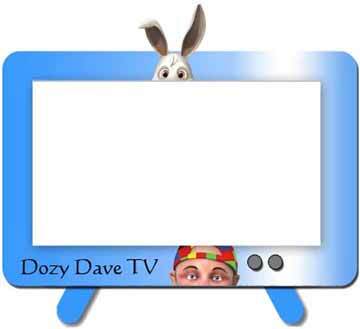 Dozy Dave has been working as a professional children's entertainer since 1996. He has a huge amount of experience in entertaining children of all ages. Every child is different. Which is why we adapt our show to your specific requirements. All shows are suitable for children aged 3 and above. We also provide entertainment for children and adults with special needs. It is wonderful when we receive testimonials from people who have either booked our services, or attended one of our shows. Please feel free to read through the many hundreds of comments from satisfied customers. Dozy Dave is pleased to have worked with a many Global Blue Chip companies. Including Tesco, Asda, IBM, The Peel Group and many more. We also work with local Councils, Schools and Sports Events. Take a look at a brief list of companies who have used our services for their events, by clicking the button below. We would love to add your company to our ever growing list. Our shows can be adapted for a wide range of children and young adults with Special Needs. We work on a regular basis for a number of organisations, including. Barnardos, Hillside Specialist School, Merseyside Society For The Deaf to name but a few. If you are unsure if our shows would be suitable for you, then please call us to discuss your requirements further. Don't follow the crowd. Do something different!! Dozy Dave's children's evening parties make all the children feel grown up. All day at school your child will be the centre of attention as their friends talk about the party that evening, with the excitement building all day. You do it yourself at work and on Facebook.